This is a message I recently tweeted while attending Islamic Relief’s Day of Dignity 2016, where a partner organization distributed clothing, food, and school supplies for about two hundred homeless people and community members in need. Events that affirm the dignity of people whose rights to shelter, food, and other basic necessities of life have otherwise been denied shed light on how dignity is something that is both innate as well as a process. 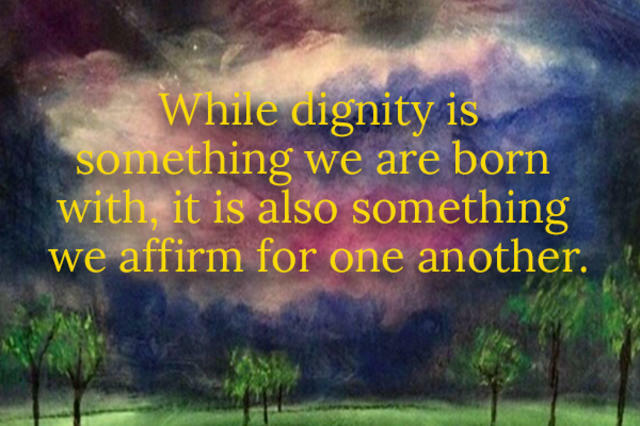 In other words, while dignity is something we are born with, it is also something we affirm for one another. It is essential to be aware of how we treat one another, because it is only through paying attention to the process that we can bring healing to a world that is plagued by inequality and violence. In the Quran, a book that I, as a practicing Muslim, revere, we are told that God conferred dignity on the children of Adam, which means on all humanity since Adam is seen as the first created human. The idea that human beings have an innate value and worth that is God given was not a new one, since religions prior to Islam also put forth that human beings are made in “God’s image” and thus have something divine in their being. In God’s view, or in the view of sacred texts, the sanctity of human life is inviolable. Yet, in practice, human beings regularly encroach upon and deny one another’s inalienable dignity when we engage in small and large acts of violence. Islamic or other religious and humanist practices that affirm dignity, such as almsgiving during Day of Dignity, help us to actualize and affirm the dignity that is our right. To confer dignity means, for me, recognizing the wholeness of people. Many times, we are stuck in ways of seeing one another that restrict people to one particular category, such as religion, race, class, gender, or sexual identity. We sometimes compel people to choose between their identities — like boxes on a survey form that ask us to choose our gender or ethnic background. Don’t get me wrong — it’s helpful to know how many people participate in a survey are male or female, or Arab, African American, or Latino. But ultimately, we are so much more than these individual labels. Bringing a holistic approach to dignity is really important for me as I do my work in city government, and I believe it begins with me. It is only when I see myself in my fullness that I can grant this fullness to another human being. When I walk into work, I want to bring my brain and my heart, my thoughts and feelings, my academic background and my applied work, my faith and my secular ideals into a passionate fusion. I actually think this uniqueness is partly an expression of what God packaged for me and for each of us as our individual dignity. From my faith perspective, it is my sacred duty to create a space, a public square, where everyone’s human dignity is affirmed. We can’t affirm dignity without seeing one another first and foremost as full human beings, beyond the roles that we each play or the identities we carry. Seeing people as whole human beings also has implications for how we live out democracy, which is a process as much as a product. Democracy is a form of government in which people come together to give voice to their opinions, identify common problems, and agree on solutions that benefit the common good. Dialogue and deliberation are two distinct processes that inform democracy, and dialogue must come first. It helps us get acquainted, which is important to do before we can make decisions together. Dialogue is especially needed as we encounter people whose opinions, history, experiences, and identities are different from ours. Dialogue helps us create a shared space where we discuss what matters to us, what we have in common, which differences we can bridge, and which we must agree to disagree about. Dialogue is a process that ideally lets us be who we are, without judgment. It respects the sanctity and dignity of each human voice. Then, as we identify what matters to us individually and in groups, we must deliberate and think critically in order to figure out common priorities and how we can solve problems together. Both of these processes are needed in order to create a healthy public square. When we deliberate and make judgments without first having engaged in dialogue, there is a risk that we will come from a place that sees people based on single identities as opposed to one that acknowledges everyone’s complexity. We may use win-lose frames, listen to one another less, put each other’s ideas down, and ultimately deny the worth of each person’s unique voice. I cannot work with you to figure out what policies we should pursue if I haven’t bothered to respect you as a human being with dignity. I can’t reduce you to categories and unitary identities of black, woman, Catholic, Republican, and expect to find solutions that work for collective humanity. 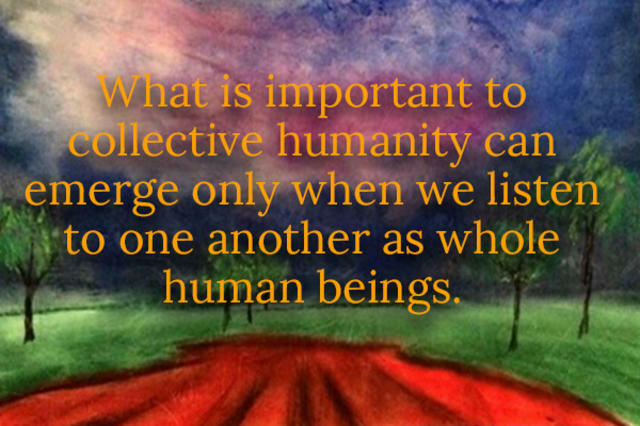 What is important to collective humanity — the common good — can emerge only when we listen to one another as whole human beings, not as special interest groups. As I reflect on the nature of human dignity, I am coming to see that it is a responsibility as a well as a right. It is both something that is rightfully ours and something we must give to one another. In our daily interactions, when we treat one another with respect and compassion, what we are doing is affirming one another’s humanity and wholeness, and fundamentally recognizing the divine gift given to each of us. Sarah Sayeed, PhD, is a Senior Advisor to the Community Affairs Unit for the City of New York. Previously, Dr. Sayeed served as Director of Community Partnerships for the Interfaith Center of New York, working to foster interfaith dialogue, civic engagement and community outreach across the five boroughs. She has also taught communications and cultural competency in health care at the School of Public Affairs at Baruch College. Dr. Sayeed’s research on communications, addiction and treatment within the adolescent and Muslim communities has appeared in numerous books and journals. In 2014, she was recognized by the NYPD Community Affairs Bureau, Council Member Jumaane Williams, and Brooklyn Borough President Eric Adams for her service to the city’s immigrant communities and her support of the Police Department. In addition to her professional work with faith communities, Dr. Sayeed also serves as a Board Member for Women in Islam, Inc. and is a member of CUNY Dispute Resolution Center’s Advisory Group. 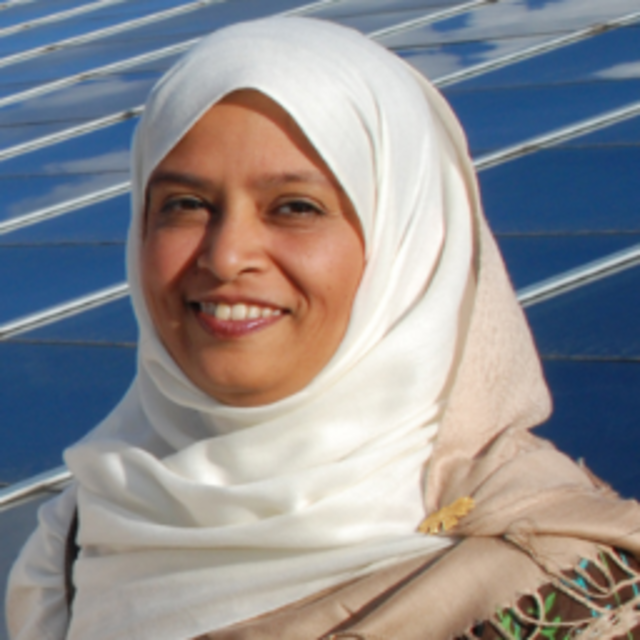 She is also a member of the Islamic Society of North America Mosque Development Committee. Sayeed received a Bachelor's degree from Princeton University, where she studied sociology and Near East Studies. She is also a graduate of the University of Pennsylvania Annenberg School for Communication, where she completed both her Master’s degree and PhD.